One of the guiding principles of housing provider Housing 21 is to enable residents to have increased independence and take control of the services they need. With standard bathrooms, however, the residents at Kenneth Launder Court in Liskeard in Cornwall had lost their independence in one very important part of their lives – that of personal hygiene. That is now a thing of the past and lives have been “transformed” with adapted bathrooms from AKW. When refurbishment of the bathrooms was scheduled, Housing 21 turned to AKW. Specialist surveyors from AKW consulted each resident on their individual needs and worked closely with the recommendations of occupational therapists to provide a solution for each unit. Key to this was removal of the baths and replacement with low-level shower trays and electric showers. Standard electric showers can have their limitations for people with restricted mobility or in need of assistance when showering. The shower chosen for the Kenneth Launder refurbishment was AKW’s award-winning LUDA electric care shower. With an IP45 rated waterproof shower unit that carries a comprehensive BEAB Care approval, the LUDA can be located anywhere in the bathroom to meet accessibility requirements, either in a shower cubicle or over a bath, and at any height, in complete safety. This offers a huge amount of flexibility in siting the shower unit and it can be done to suit an individual resident’s requirements. With a non-return valve in the shower unit, there is no need for the shower head to be retained so the user, or carer, has full use of the extra-long shower hose. A particular benefit of the LUDA is its integral grab rail. Riser rails in standard electric showers are relatively flimsy, designed simply to keep the shower head in position, so additional grab rails are necessary. In designing the LUDA, AKW decided that a neater, more aesthetically pleasing solution would be to combine the two functions in one and make the riser rail into a grab rail capable of supporting 90kg of weight. 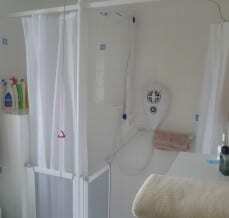 Depending on individual residents’ individual tastes and needs, AKW also fitted a range of shower screens, including half-height screens for those units where a resident needed help with the shower, Sulby and Tuff Form shower trays, 4000 series shower seats and 1400 series grab rails. The 4000 series seat range has been designed in consultation with occupational therapists, end users and installers. The seats are strong, safe and comfortable with a 390 to 640mm height adjustment. Reinforced cushion fixing lugs suit side transfers and there is a choice of styles. The 1400 series grab rails are available in a range of configurations and feature a fluted surface for additional grip. They are available in white or blue for users with visual impairments. To say that the new bathrooms have transformed life all round at Kenneth Launder Court would be no exaggeration. Lesia Surgery says: “Before the adaptations, I was organising carers to visit certain residents three times a week to help with bathing and now no one needs help. It’s great that our residents have total independence. I’ve had excellent feedback from the occupational therapists and the fact that the adapted bathroom had been installed has even meant that one resident was able to return early to her own home from temporary residential care after a nasty fall.